You read about it last year… this year was even better. There were cakes! Sometimes the thought of making toast sounds like too much work. And then there are times when I take on more than I probably should… and it’s delicious! This year, my Name Day fell on a Saturday, so I figured that would be a good excuse for a cultural activity for the Norwegian class I’m taking. I invited the class and also my faithful, wonderful Swedish neighbors who are always up for waffles and cake. We had a good time, played some games, discussed the idea of what culture means and how to know when you belong to one, and we ate well! 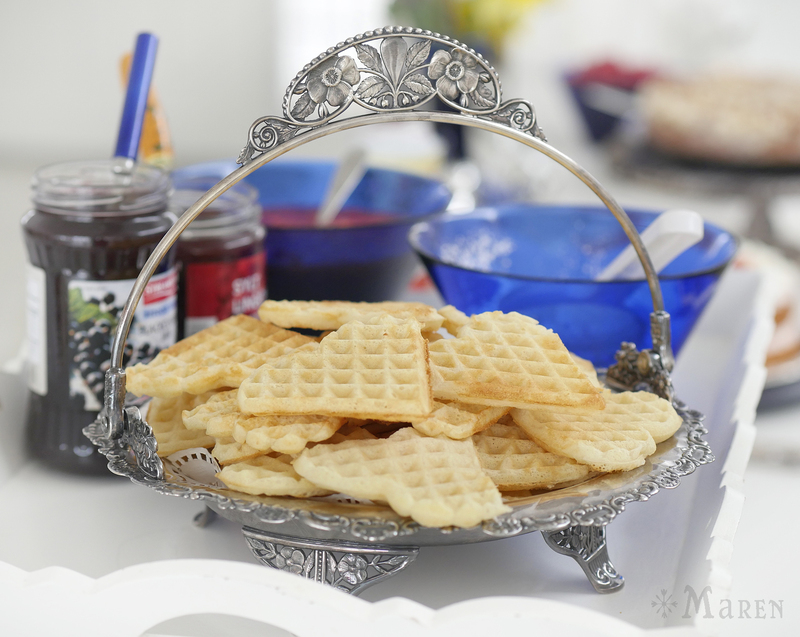 The waffles this year were from a Kungsörnen mix I bought at IKEA. They were very good, actually. If you need a recipe from scratch, I highly recommend those by Daytona Strong at the blog Outside Oslo. Everything she makes looks so good and her recipes are spot on. Additionally, I decided to make three cakes I had never made before: Strawberry Cream Cake and Toscakake from Pat Sinclair’s book “Scandinavian Classic Baking”. The final cake, “The World’s Best Cake”, aka Kvæfjordkake, was an adaptation between two recipes. 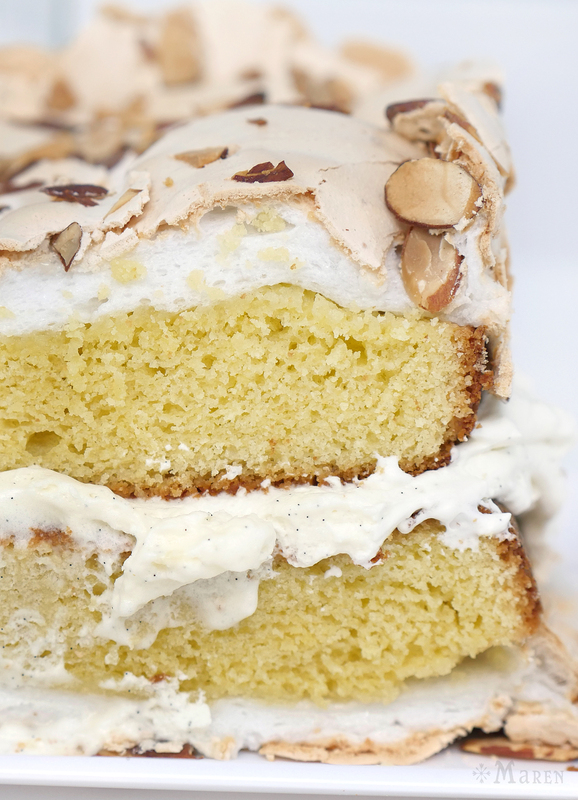 It looks a bit odd but has a great flavor with a nice balance between the dense cake and the airy meringue. Here are the recipes I used. Heat the oven to 350ºF/175ºC. Line the bottom of two 9″ (23cm) round cake pans with parchment paper. Spray them with cooking spray. In a mixer with the whisk attachment, beat together the eggs, 3/4 cup sugar, salt, cream of tartar, water, and vanilla until light and thick, about 5 minutes. Gently fold in the flour mixture. Pour into the two pans. Bake for 13-16 minutes, until the begin to pull back from the sides of the pan. Cool for 10 minutes in the pans on a wire rack. Run a thin spatula around the edges and turn out, removing the parchment paper. Cool completely on the racks. While the cake is baking, place the cut strawberries in a bowl with 1 Tbsp sugar. Let sit at least 5 minutes. In the mixer, beat the cream cheese, powdered sugar, and vanilla on high until creamy. Pause occasionally to scrape down the sides of the bowl. While on low, gradually add the whipping cream. Then increase to high speed and beat until soft peaks form. Add the strawberries and beat about 30 seconds. Place one layer of the cake on the serving plate, cover with half the strawberry cream, repeat. Cover loosely with foil or place in a cake carrier and chill for 2 hours (or overnight) before serving. Garnish with sliced strawberries and whipped cream. Refrigerate any leftovers. Heat the oven to 350ºF/175ºC. Lightly grease the sides and bottom of a 9″ (23cm) springform pan. Combine flour, baking powder and salt in a small bowl. In the mixer, using the whisk attachment, beat the egg whites until foamy. Gradually add the sugar and beat on high until soft peaks form. Scrape the egg whites out to another clean bowl. In the same mixer bowl, whip the egg yolks with the whisk attachment until they are light and thick, about 4 minutes. Fold the whites back into the yolks, using a gentle touch. Fold in the flour mixture a third at a time until incorporated. Finally, fold in the butter and almond extract. Pour the batter into the pan and bake for 22-25 minutes, until the cake begins to pull away from the sides of the pan. Remove from the oven and set the oven to broil. While the cake is baking, make the topping. In a saucepan, mix the sugar with the flour. Add the milk and butter, stirring until melted. Boil for 2 minutes, stirring. Remove from heat and add the almonds and extract. When the cake comes out, pour the topping over it and return it to the oven to broil for about 2 minutes, until the topping is golden brown. Cool on a rack for 5-10 minutes. Slide a thin spatula around the edges to loosen, then remove the sides of the springform pan. Cool completely. Heat the oven to 350ºF/175ºC. Line bottom and sides of an 8×12″ (20x30cm) baking pan with parchment paper. Beat the butter and the 2/3 cup sugar together until creamy, about 3 minutes. Add the flour and baking powder and mix on low. Add the eggs yolks and milk, mixing to incorporate. Spread the batter in the pan, but do not put it in the oven yet. Make the meringue in a large clean bowl. Whisk the 5 eggs whites with the remaining 1 cup sugar until soft peaks form, adding the dash of vinegar right before finishing. 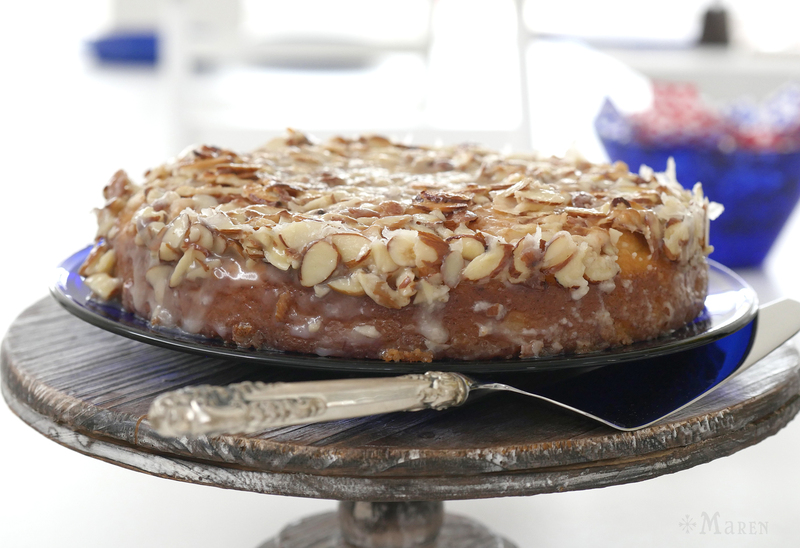 Spread on top of cake batter, sprinkle with the almonds. Bake for 30 minutes or until the meringue is puffed and golden brown. Cool in the pan. Remove to a cutting board and slice across to cut in half. When the cake is cool, make the filling by whipping the cream with the vanilla extract, vanilla seeds, and powdered sugar. Beat until nearly stiff, about 3 minutes. On a platter, place one half of the cake with meringue side down. Spread whipped cream, then place the other half of the cake on top, meringue side up. Cover and refrigerate cake at least 1 hour before serving. Refrigerate any leftovers. 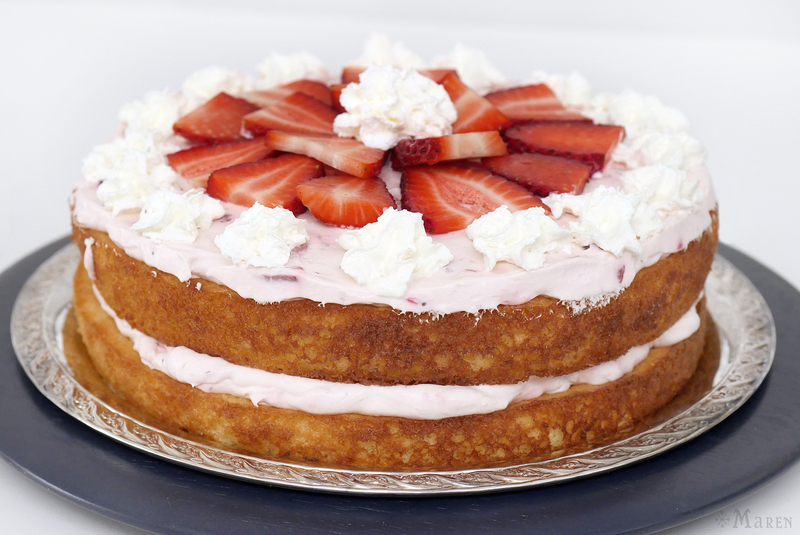 This entry was posted in Holidays, Recipes, Regarding Food, Thirty Marens Agree and tagged Baking, Best Cake, Cake, holiday, Kvæfjordkake, Maren, name day, names, Norwegian, Scandinavia, strawberry, Tosca by Maren. Bookmark the permalink. I want to help clean out your refrigerator.